Ten Tip-Top Jewellers have each been invited to create a special tiara which will be exhibited for the public to vote on their favourite. Everyone who casts a vote will be entered in a Prize Draw to win a £100 Voucher to use at the gallery. All ten tiaras will be for sale, but can only be taken at the end of the exhibition. As always, on display are contemporary classics for men and women crafted from precious metals and jewels, including Edwardian diamonds, black diamonds, sumptuous pearls and rubies. 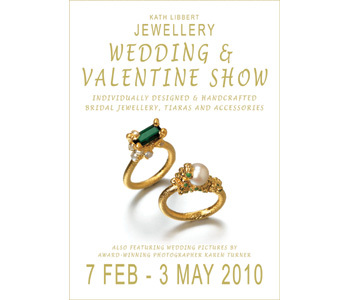 Established at Salts Mill in 1996, the Kath Libbert Jewellery Gallery shows a constantly changing selection of contemporary jewellery and accessories throughout the year, complemented by major exhibitions, often featuring top European designers as well as the cream of British talent. All the jewellery is individually designed and handcrafted, and can usually be made in silver, gold or platinum and set with stones of your choice. We’re always very happy to help you commission your own more personal pieces. We also stock a wide range of rings for men, as well as cufflinks. We look forward to seeing you. Artists featured in 'Alternative Wedding Show 2010' are: Alexis Dove; Malcolm Morris; Jo Hayes-Ward; Nicola Malkin; Sarah Stafford; Ruth Tomlinson; Jacks Design; Jennie Gill; Natalie Jane Harris; Mirri Damer; Michael Carberry; Kate Smith; Jean Scott-Moncrieff; Bex Bardon; Iain Henderson; Diana Porter; Poppy Dandiya; Sarah Collins; Julie Usel; Nicola Perkins; Sarah Lawrence; Phoebe Coleman; Hannah Peters; Tanja Ufer; Mikala Djorup; Shona Carnegie. Artists featured in 'Ten Tip-Top Tiaras' are: Alexis Dove; Malcolm Morris; Nicola Malkin; Bex Bardon; Sarah Lawrence; Nicola Perkins; Ruth Tomlinson; Katherine Grimes; Hannah Peters; Fiona Cameron.